After several months of blustering and delays, the Federal Transit Administration has finally signed off on the full $647 million in federal funding needed to electrify California’s Caltrain commuter rail system. The move comes several anxious months after the new administration indicated it would scuttle previous funding agreements for public transportation projects across the country as a way to punish cities that have so thoroughly rejected the new president. The funding was originally completely left out of the earliest budget proposals announced by the White House, but hope returned two weeks ago when a preliminary congressional plan seemed to walk back the de-funding talk. That budget contained partial funding commitments for urban transportation initiatives, including $100 million for Caltrain electrification. After weeks of outspoken criticism from California’s political leadership and pleas from transportation activists, news this week of full funding for the project was widely seen as a welcome political victory. In a statement celebrating the new funding agreement, Jim Hartnett, CEO of Caltrain touted the economic development potential for the project, Mass Transit reports, saying that Caltrain Electrification will ease congestion in “one of the country’s most economically productive regions” while also “creating almost 10,000 American jobs in the process.” Caltrain, a regional commuter rail network that serves the Bay Area and its environs, is in the midst of converting its diesel-powered train fleet into an electrically-powered one. Train electrification produces fewer greenhouse gas emissions than diesel power—especially when the energy used to power the trains is generated through renewable means—and has also been recently touted as a vehicle for so-called solutionary rail reforms. 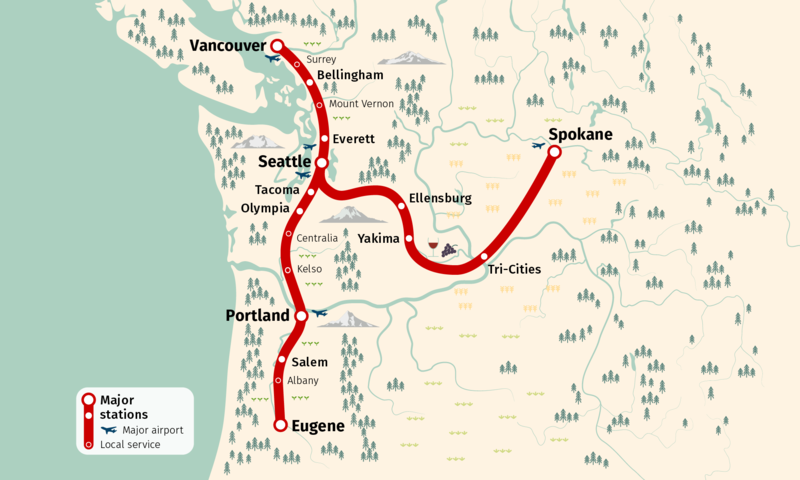 Solutionary rail approaches combine sustainable electrical grid modernization initiatives with high-speed rail expansion to multiply the environmental benefit of train networks. Although electrified railways are the norm in countries with advanced train networks, only about 1% of rails in the US are electrified. In California, the move is a necessary precursor to the state’s forthcoming High Speed Rail network. Electrification will require that Caltrain purchase new locomotives and the organization is currently soliciting input on forthcoming train graphics. Caltrain is currently working on the designs for the electrification improvements and is expected to begin construction sometime this year, with a project completion deadline of 2020 or 2021. 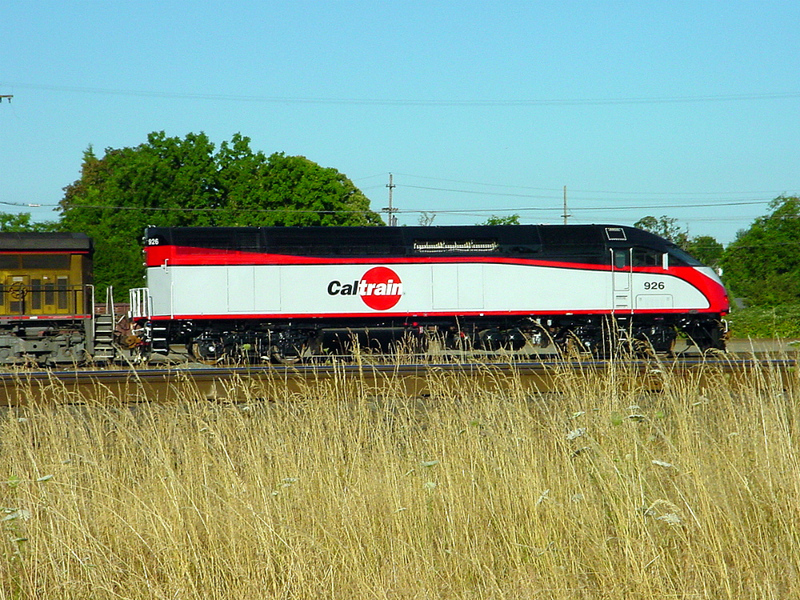 For more information on the Peninsula Corridor Electrification project, see the Caltrain website. 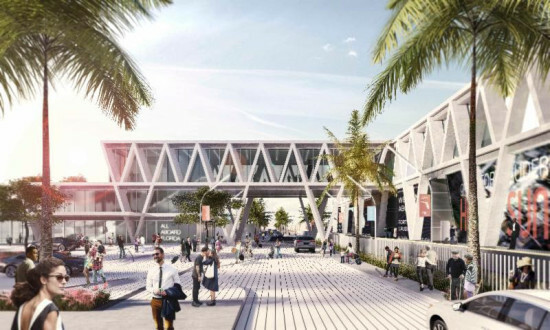 In May, SOM released renderings for Miami Station—a 1,000-foot-long, multimodal transit hub that would anchor the Sunshine State’s impending high-speed commuter rail system known as All Aboard Florida. 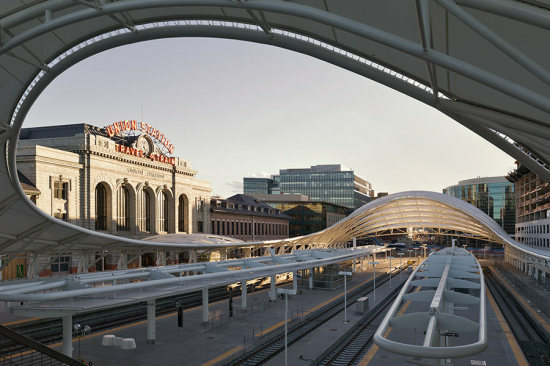 The firm floated the station 50 feet atop reinforced concrete trusses to allow for restaurants and retail, and an uninterrupted street grid. Now, with the Miami station getting underway, SOM has unveiled plans for the system's Ft. Lauderdale station, and it appears that a design trend is emerging down in Florida. At first glance, the 27,500-square-foot station, designed by SOM and Zyscovich Architects is just a smaller version of the first go-round in Miami as it is similarly defined by concrete trusses and lifted above grade. It is primarily comprised of stacked glass boxes that rise over the street and connect the ticketing lobby to the departures area. 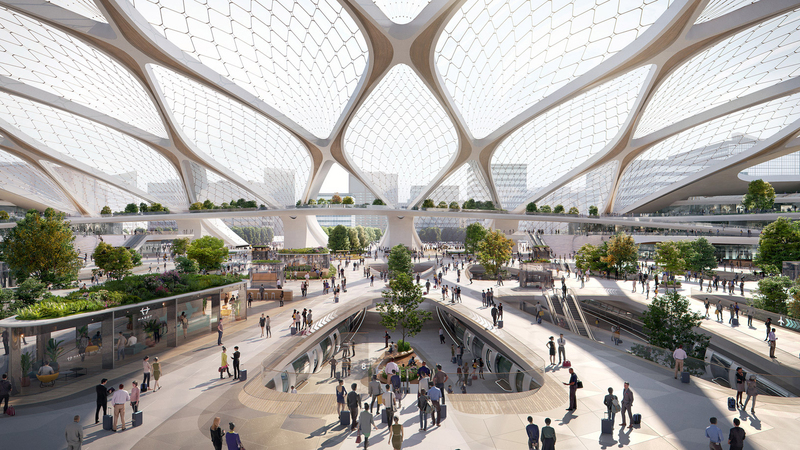 "Given the large scale of the All Aboard Florida project, creating a sense of overall unity for the entire transportation network – while conveying a sense of identity for each individual station – is one of the primary design goals," said SOM in a statement. 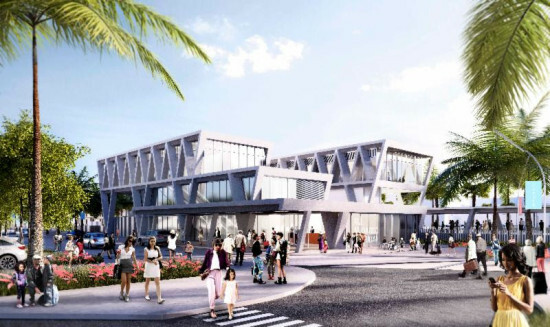 "The design of the Fort Lauderdale station achieves this balance by incorporating the lightness and transparency that characterizes the Miami terminal, while taking advantage of its unique site to create a distinctive landmark for the port city. "Its design—lightweight and luminous—both responds to its setting and creates a striking infrastructural icon for the city," said Roger Duffy, a design partner at SOM, in a statement. This is essentially the same way Duffy described Miami Station when AN sat down with him in June. If it ain't broke... SOM and Zyscovich are also designing All Aboard Florida's stations in Orlando and West Palm Beach, but no word yet on what a design for those stations might look like, or if trusses are slatted for those cities as well. When Elon Musk makes plans he makes no little ones. And he feels California shouldn’t either. This is the rationale behind Hyperloop Alpha, a supersonic, solar-powered, air-cushioned transit system (and future “Never Built”?) he views as the bolder alternative to conventional high-speed rail. It’s not a train, exactly. 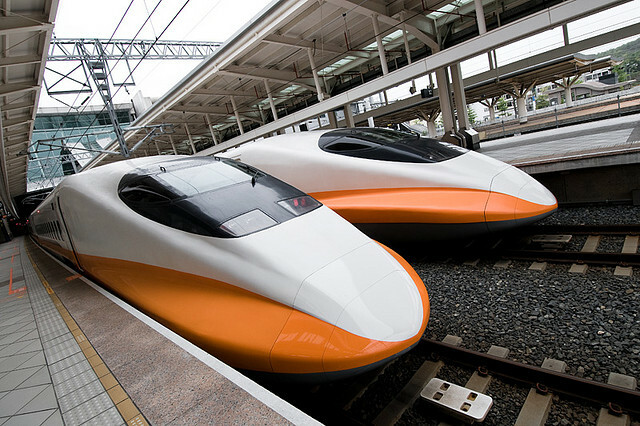 It’s more a hybrid between high-speed rail and the Concord. It’s Mr. Musk’s answer to the ever-delayed and increasingly expensive bullet train being proposed by the California High-Speed Rail Project that was supposed to be “shovel ready” in 2012. 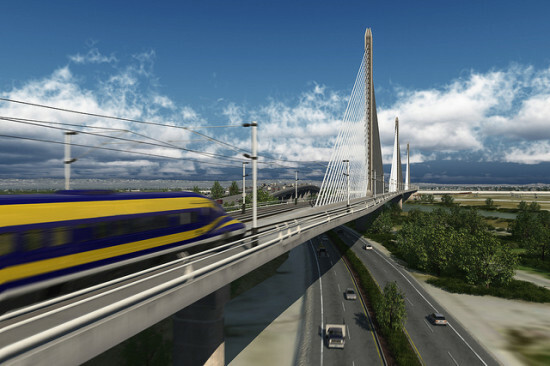 Turns out it’s more complicated and expensive to build high-speed rail than anybody in the state ever thought. 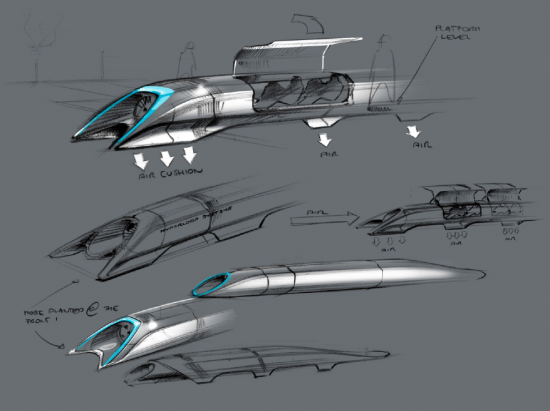 Could Hyperloop, more bullet and less train, be the answer? If it’s true it could be built for less than one-tenth the cost of the $70 billion high-speed rail system, then perhaps yes. For a mere $20 (He’s really thought this out) you would be able to strap yourself into a thin aluminum tube and get shot (at speeds of up to 750 mph) to San Francisco in about 35 minutes. The design doesn’t feature any windows, so hopefully there will at least be some video monitors or soothing ambient lighting to relax passengers who are essentially locked inside a jet engine hurtling itself through an elevated steel pipeline. In a conference call following the release of the 57-page PDF outline of the project, Musk said there could be a prototype ready for testing within the next four years. 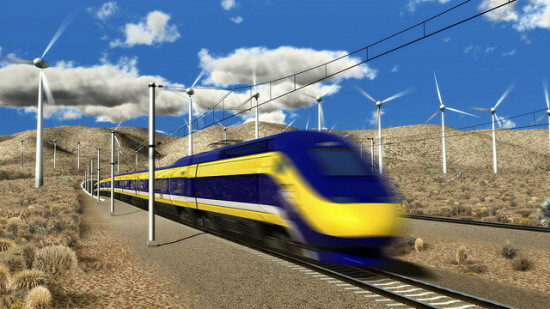 Perhaps it’s time for the California High-Speed Rail Project to hire Mr. Musk and his team of engineers and optimists. At least then California could have some form of 21st-century transit underway before 2020. 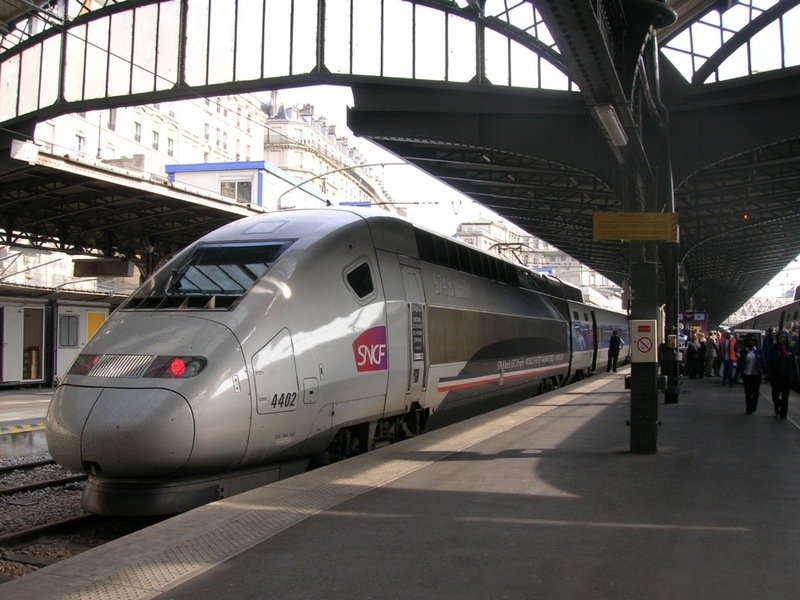 The Federal Railroad Administration (FRA) today named Illinois’ Department of Transportation the leader of a multi-state effort to advance high-speed rail. Illinois, California, Michigan, Missouri, and Washington will use $808 million from the FRA to build 35 new diesel locomotives and 130 bi-level rail cars. California led the group last year, in which 130 bi-level rail cars were procured for high-speed service. “Our goal is to offer 110-mile-per-hour service on at least 75 percent of the Chicago-St. Louis corridor—the segment from Dwight to Alton—by the end of 2015,” Illinois Secretary of Transportation Ann L. Schneider said in a statement, “and these locomotives are the key to achieving that goal.” A test run on a portion of that track last fall set a regional record for high-speed rail at 111 mph. Full service at that speed between Dwight and Joliet is expected in 2017. 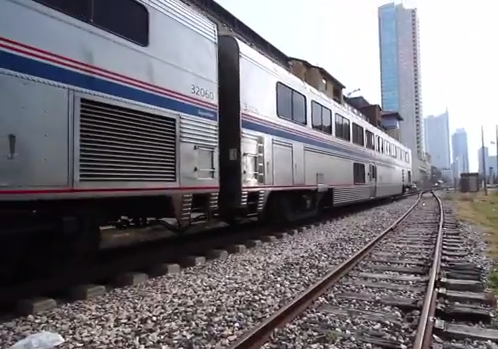 Illinois is also working with Michigan to provide 110-mph service from Chicago to Detroit. The trip would take roughly three hours at that speed.